Be the first to share your favorite memory, photo or story of Katherine. This memorial page is dedicated for family, friends and future generations to celebrate the life of their loved one. Mrs. Katherine Mae Robinson, 73 of Livingston, died Thursday, September 27, 2018 at the Compassionate Care Center in Richmond. She was born in Rockcastle County, KY on October 12, 1944 the daughter of Tyree and Maggie Gray. She was a retired LPN and was a member of Morning View Holiness Church. She loved gardening and going to gospel singings. 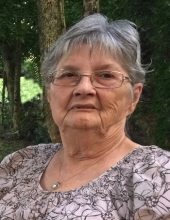 She is survived by her son, Hencie Norman Childress and wife Vivian Kay of Brodhead; her daughter, Julie Kaye Hazelwood of Livingston; two brothers, Lewis Gray of McKee and Jim Earl Gray of Livingston; a sister, Geneva “Dee Dee” Howard of Mt. Vernon; four grandchildren, Justin Burkhart, Hanna Childress, Owen Hazelwood, and Emory Hazelwood; and two great grandchildren, Hunter Burkhart and Daisy Agee. In addition to her parents, she was preceded in death by her husband, Willmer Robinson; three sisters; and three brothers. To plant a tree in memory of Katherine Mae Robinson, please visit our Tribute Store. "Email Address" would like to share the life celebration of Katherine Mae Robinson. Click on the "link" to go to share a favorite memory or leave a condolence message for the family.